A few years ago businesses weren’t exactly convinced that they should be spending time on social media. In 2015 there’s no denying that social media must be considered part of your marketing strategy. Getting started on social media may seem complicated, difficult or confusing, however these 5 tips should help make it more manageable. Don’t sign up for every social media account. You should research and be selective on which accounts you start. This way you can focus your time and effort creating a strong social media presence on a channel that resonates with your company. The more accounts you have to manage, the more your time will be divided, and the more likely it is you’ll do a poor job across the board. You might also want to reserve your brand name on the major social networking sites, even if you don’t plan to use it. Choose 2 or 3 sites where you feel you’ll get the largest return on your investment. Be sure to select the networks where your customers spend the most time or where they engage the most. You don’t need to spend hours everyday on social media. Be efficient and schedule content in advance. Commit to a few hours a week (actually put it in your calendar) to draft new content and source valuable content to share. Leverage tools like Hootsuite or Buffer to schedule updates to multiple profiles in one place. If you want to see results, then you need to integrate. Make sure you’ve integrated your social media plan with your marketing strategy. This means integrating into your brand, messaging, campaigns, cross-channel marketing, advertising, content strategy and much more. Finally, link your profiles to your website, digital properties, customer relationship management (CRM) system. You can also cross purpose content across platforms. Monitor brand, industry and competitor mentioned. Social media provides a unique opportunity to stay connected to content and opinions that are important to your target audience. Be sure to monitor any reviews or mentioned of your business. Paying attention will provide you with opportunities to join into the conversation, provide a point of view and hopefully some value. Use monitoring tools to track any mention of your company, brand social media handles as well as keywords related to your target audience. Monitoring will also provide you with the ability to adjust your strategy and implement improvements. If you plan out your approach to social media it will be less daunting. Stick with it and you will see results from your effort. Marketing and advertising isn’t easy and it usually isn’t cheap. While you can find cost effective tactics you there are 5 things to consider before you start marketing. You need to know what your objectives are and what benchmarks (if reached) will make your marketing tactics or campaigns successful. This can include impressions, visitors, clicks, leads, conversions, cost per lead/conversion, etc. Knowing the specific results you want from each campaign will allow you to take the guesswork or emotion out of your decisions and invest in what marketing tactics perform. Before you start advertising, think about who, what, where, when and how you generate a sale. This will determine when and where you want to advertise. Without alignment, you won’t generate any revenue or return on your marketing investment. You should also think about capacity and inventory. You don’t want to advertise unless you can deliver. How many calls, leads and emails can me (or my team) effectively handle in a day/week/month? How do you handle each incoming lead? Do you make outbound phone calls? Have you conducted sales training? When do you receive the most leads or sales? Is there seasonality to be considered? What marketing mediums generate the highest quality of leads? Who converts the most leads and where do they come from? Marketing performs best when you provide value and are focused around solving an issue or a need. Your creative and messaging should focus around your customers. Don’t hard sell or only talk about yourself. Create benefit-worthy messaging to help increase the results of your marketing. What key issues are important to them? Is there a point of view to consider or address? What emotions or feelings do they experience before, during and after converting from a lead to client? Can you provide unique value? Is there a competitive position to take? Consider a variety of marketing strategies and tactics. This includes local advertising (TV, radio), outdoor (billboards, transit), direct marketing, digital (display, PPC, SEM), social media, mobile, etc. Testing will help you improve and fine-tune your marketing efforts. Think about this before you launch a campaign to so you track it and measure results. Review monthly or quarterly and decide if you need to end the campaign, renew, refine, etc. Here are 4 ways ways to increase attendee engagement at your events. Event marketers can gather attendees’ preferences during the online registration process, which allows them to personalize the event experience for each attendee, from using their name in an email to adjusting event offerings to match topics that interest attendees most, to delivering relevant content that matches defined interests via a participant’s preferred communication method/platform. Social media has been credited with increasing brand awareness, event attendance, media coverage, and sales. Most of all, social media can create and enrich relationships between clients and prospects, leading to greater attendee engagement. Communities take different forms, but the bottom line is that community-oriented opportunities keep attendees more strongly engaged. Event marketers can take their participants’ common interests and develop an event-dedicated Hashtag, Landing Page, LinkedIn Group, Google+ hangout, or Facebook page. People are engaged with their smartphone or tablet more often than not. The proliferation of mobile devices makes them a natural vehicle for increasing attendee commitment, participation, and satisfaction. Mobile-friendly event apps can deliver updates and helpful links. Attendees can become further engaged at an event by participating in real-time surveys or accessing speaker content as an event is taking place. Lack of planning, overextending yourself and failing to engage your audience can effect your digital marketing and social media efforts. Social media has been around for a few years, but in that time marketers and researchers have made some pretty interesting findings. Before, sites such as MySpace, Friendster, and Facebook merely connected you with friends online. Now, businesses have taken advantage of social networks, integrating social media into their strategies. This approach has yielded impressive results, but along with those successes have come growing pains of how to best use social media for business and marketing. Here are 10 mistakes of social media marketing. Any business looking into social media must establish a plan. Determine the goals and objectives for yourself and for each site. Are you trying to get 10% more followers each month? How many people would you like to interact with each week? Having a plan is a must. Activity matters, size doesn’t. It’s better to have an intimate group of engaged followers who continually interact with you than having thousands of passive followers who don’t. More followers and more traffic do not equal more money; you need the right people to engage with your business. Each social media account should get a fair share of your attention. If you have time for a couple social media pages then use them to the fullest extend. Don’t start accounts on social media sites if you can’t maintain them. Vary your posts so you’re not always talking about your business. Sometimes you have to think of your business as if it were a person. Don’t be like those people who constantly talk about how awesome they are. The more you force content, the less valuable and engaging your page will be. There is nothing engaging or attractive about spelling and grammar mistakes. Double-check and proofread your material before you send it out onto the Internet. Not only will errors make you look unprofessional, but they could also harm your credibility. Statistics are important in every marketing campaign. All social media networks offer analytics and reports to track page views, post reads, shares, activities, and more. Through these valuable data you can see which posts draw the best audience response so you can offer more value to them. Social media gives your business the opportunity have a strong, unique, personable voice. Be open, insightful, witty – whatever your business brand should embody and deliver it. Ask questions. Get feedback. Start discussions. Social media gives you something no other marketing channel offers: the opportunity to connect directly with your audience. Not only does this strengthen customer relationships, but it also brings more activity to your business. The Internet includes the good, the bad and the ugly. Unfortunately, not everyone online is going to be nice or agree with your business. Be calm, professional and handle negative comments graciously. Remember, everything said online is public. Building your social media presence takes time. Don’t give up. Stay active. Be patient. Your efforts will pay off; just give them time. Simply put, LinkedIn is a professional social media platform that has been steadily growing in popularity and use, especially for search, business networking, hiring, referrals, leads and even financing. If you haven’t made a business LinkedIn business page, you’re missing out. If you have already have a business LinkedIn page for your business you should review it and optimize it. Luckily you can probably use these recommendations on your other social media pages (Facebook, Twitter, Google+, etc.) as well. Here are 7 tips to help you create (or optimize) a great LinkedIn business page. Make sure your branding is aligned with your company and overall marketing strategy. If someone is discovering you first through your LinkedIn page, they should be able to know and understand what your company is about. Make sure your images are sized correctly, not distorted and speak to your target audience. Also, include links to your company website. On the Products & Services page, testimonials and recommendations are highlighted prominently. This will have a direct impact on the number of Linked members who’ll end up visiting your website. Encourage customers to recommend your products and services here as well. Optimize your LinkedIn company page content so it speaks not only about what you company does, but also what your customers will be searching for. Include keywords or buzzwords and make sure that the content provides value to readers. If your business operation spans multiple locations, you may want to list all of them. LinkedIn allows visitors’ location as a search criterion to narrow down results. You can add up to five different locations to your page. Also, consider including a short video (30 seconds) summarizing your company and it’s offerings. A well-made and appropriately branded video can encourage many to “follow” or engage with your company. The advertising options provided by LinkedIn are definitely worth checking out. InMail, Display Advertising and Sponsored Posts will help you build a large follower base effectively and affordably. The advertisement can be targeted by job title, location, and many other options. LinkedIn Insights will help you track the success of your page and improve it This includes impressions per post, user engagement, follower demographics, audience insights, etc. It also connects to promoting your page (#4) and will help you optimize your targeted posts and determine return-on-investment (ROI). Social plugins are a great way to quickly share your content on various social media platforms. In addition to getting your content shared, you could also drive visitors from your website toward your LinkedIn business page. You can select recommend, follow, endorse, or share buttons on your site to drive traffic to your business page. Think about where you will place them on your website and choose the best one to achieve your objective. You should also place your LinkedIn logo (vector image) on your digital assets (website) as well as your marketing collateral (brochures, PowerPoints, business cards, etc.). That being said you should do this for all of your social networks. Your objective is (or should be) to engage you audience and give your brand as much positive awareness as you can. Keep your page and audience updated regularly. Post information, comments, and tips on a regular basis. When you share information, keep in mind the professional demographic. You can even consider creating a LinkedIn group for your company (internal and/or external). Twitter has become a great tool for markets and companies. This social media platform is sometimes overlooked when developing a social media and/or digital strategy. Most companies focus on Facebook, but this post will focus on Twitter and how Twitter ads can help leverage and expand Twitter’s ease of use and viral outreach. Twitter ads can help you offer timely, relevant and useful information targeted at a geographic specific area (even as close as a postal code). Twitter’s geo-targeting features have enabled businesses to tailor their marketing strategy and increase their local presence. By providing users with thoughtful, helpful, useful content you will increase engagement and your online exposure. A brand can help you (and your name) stand out from the crowd. There are many ways to brand and social media is one you should use. Your ability to use social media for branding will greatly depend on having a clear underlining fundamental understanding of social branding concepts. Facebook Fan Pages are amongst the best social media tools for branding simply because it has amazing potential to build a great fan following for your business. There’s no other social network in the world with over 1.15 billion active users, 16 billion pieces of content, 11 million active pages and almost 60 million users becoming fans of Facebook Pages each day. What can 140 characters of text do to establish your brand? A lot! Twitter is a great brand for building a reputation. You can reach out to millions of prospect customers with a few twitter clicks. You can access twitter from your computer, your phone – from the twitter website or through any of the thousands apps available for twitter. Twitter allows you to start conversations with like-minded peers/ prospects, share valuable news and information, build your audience, stay connected with latest events and finally build and monitor your own brand and reputation. LinkedIn is known for its networking capabilities. It’s very important that you take advantage of that. Start by adding people you know to your network. Then, when you’ve built up a good-sized network, you can start to see people from your friends’ networks. It’s a great way to interact with and meet people who could be crucial to your industry or business. LinkedIn allows you to participate in conversations, which gives you a great opportunity to be a voice for your industry and show how much of an expert you are. Join some groups that relate to your niche and get in on the conversation. This will also help you to network with people in your niche. Most customers like to see brands in action rather than go by word of mouth. YouTube offers a great way where you can show videos of how your brand works and how you’re superior than your competitors. Create your own branded channel on YouTube and see the world of difference that it makes to your online audience. I love to read about a brand before I get associated with it. In today’s modern age, many consumers think alike and are keen to spend some time reading about brands before they commit to them. A blog is a great place to showcase your brand. Coupled with SEO and smart tags, blogs are a great way to establish your brand online. Blogs help spread brand-awareness as well as serve as a great medium to educate users about the details of a brand and business. People. Who is your target group? What kind of clients and prospects do you have? How do they behave online? Knowing the people who you want to communicate with and where they are is where, is where you should be. Objectives. What are your goals? Do you want to increase leads, track conversion, generate awareness, gain insight or foster engagement? Do you want to talk, collaborate, immobilize or evangelize? Deciding on your objective before selecting a technology will help you in the long run. Strategy. How are you going to reach your objectives? Make a plan and envision where you would like to end up. Use this to plan backwards. Which direction(s) would you like to take? How are you going to improve your relationship with your customers? What do you want to get out of these relationships? What will be different when you are done? Technologies. 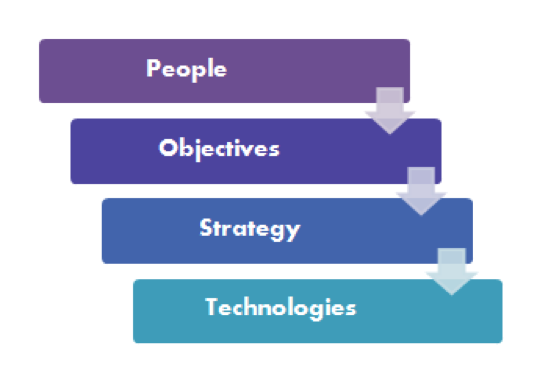 What technologies and applications should you use to accomplish the first 3 steps (P-O-S)? What is a reasonable yet accurate timeline? Whether this means an online community, a blog, a few blogs, or some dashboards, this should be your last step. This may sound complicated, but it’s not. The Forrester Post method can help you create an effective and well-thought out social media strategy.